Implant Dentistry - Screw It or Not? In recent times, implant dentistry has become one of the most talked about topics between patients and dentists. There are lots of advertisements out there which talk about implant dentistry as well as All-on-4 implant replacements of natural teeth, how easy they are, and so on.Before you decide whether to screw it or not, let’s start by introducing you to the basic premise of what exactly dental implants are. 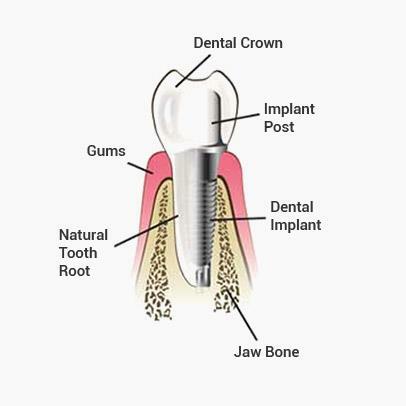 A dental implant is just a titanium screw that is screwed into the bone with specialised drills. Once that screw integrates with the bone, it then ends up becoming part of the body and serves as a root structure for the future dental crown that’s going to be attached to it. Once the dental crown, which is usually porcelain or ceramic, is attached to the implant, this entire structure serves the same function as a natural tooth, effectively replacing the missing one. In addition to assessing the site of the missing tooth, there are a lot of other important criteria that determine the success of an implant and whether it’s even right for you to begin with. In this post I’ll discuss the three major factors contributing to a successful dental implant. Firstly, the most obvious factor is the level, amount and quality of bone present at the site where the tooth needs to be replaced. Not everyone is a good candidate for an implant restoration. Some conditions which reduce the suitability of implants are when there is difficult or soft bone remaining in the area, when there’s infection present, or when the bone width is insufficient, to name a few. In some cases, this can be remedied by certain specialised advanced procedures to help augment the bone or assess the height and width. This then makes it possible to have a dental implant in the future. The second factor in assessing the success of an implant is a patient factor, which is essentially the relative risk the patient brings to implant dentistry, or their medical condition. One common example I’ve come across is a patient with uncontrolled diabetes. In this case, he/she will have a poor healing capacity, which would unfortunately lead to the implant failing to integrate with the bone. Another example is smoking, which often complicates everything else in your body. While it’s widely known that smoking affects systemically, it also causes several complications in the mouth such as drastically reducing the healing ability of tissues, which then leads to failure of implants as well. The third major factor in the long term success of an implant replacement is actually the hygiene and maintenance of the implant. This is unfortunately the most ignored aspect of implant or complex dentistry. After visiting the dentist and spending thousands of dollars to replace teeth with complex procedures, many patients lack the motivation thereafter to come back for regular maintenance of their teeth and these complex restorations. What this in turn leads to is a significant accumulation of plaque and bacteria around these restorations and the bone in which that implant has been placed. The gum tissue swells up, causing basic peri-implantitis, which is infection around the implant. The implant actually loosens, the bone around it is degraded, and the entire tooth can be lost again! What’s most unfortunate is that this factor can be easily controlled by effective home hygiene measures. There are specific kinds of brushes and certain cleaning methods that can be used around implants such as Waterpik, air flossers, interdental brushes and implant brushes. This, in combination with regular visits to the hygienist, can assure long term success of the implant. All-on-4 implant dentistry is one of the latest trends in teeth replacement and we’ve heard a lot of advertisements about implant and All-on-4 dentistry. I often have patients walk into my practice with salvageable teeth, in not exactly a horrible condition, asking to have all their teeth replaced with a new set of All-on-4 implants. Now that option should really be the last option to consider because there’s nothing better than natural teeth! All-on-4 procedures, as the name implies, involves placing 4 implants to replace the tooth. This is a suitable option in cases where the patient has had irreversible damage to the underlying bone due to periodontal disease, gum disease or caries, or where the teeth look like they cannot be salvaged for the next 10-20 years. This is a one-time option where we put patients under general anaesthesia for all the major procedures including extractions, preparation of the bone, placement of the implants, and placement of the little abutments that hold the teeth in place. All these can be done in one long appointment under general anaesthesia; when patients wake up, majority of their work would have already been completed. Through this process we can actually turn around new teeth in less than 48 hours. A complete protocol is followed for every patient which includes lots of measurements, moulds, and photographs before the operation so we can prepare some guides for the patient. The teeth can then be turned around in as little as 2 days. After all, we want them to be toothless and without a smile for as minimal a time as possible! While we carry out many All-on-4 implant dentistry procedures, this is something that definitely can’t be taken lightly, and has to be weighed against all the risk factors of the patient, and future maintenance issues such as hygiene routines the patient needs to follow. In addition, it’s essential to consider how patients will be feeling after these implants in terms of their ability to chew, their smile, social confidence, and so on. There’s a very specific procedure that has to be done for each individual patient – there’s really no “one-size-fits-all” when it comes to implant dentistry. I hope this blog has you feeling more informed about implants, it’s part of an ongoing educational series I’ll be writing for anyone following and reading my blog. I’d be more than happy to discuss more or answer any of your questions. Call in to Healthy Smiles Dental Group at 03 9877 2035 or email us at info@healthysmiles.com.au for a free no-obligation consultation. We’ll give you some understanding of how you’re doing so you can make more informed decisions going into the future. « Snore No More – It’s Easy!